← What Book Have You Read Multiple Times? While there are plenty of things that I get very passionate about (search this website for “rant”), my hair has never been a topic I really cared about one way or the other. I just don’t care, period. I don’t understand all of the fuss over hair replacement procedures, Rogaine, $100 haircuts at fancy salons, toupees, or the idea that any man without a full, thick, lush head of hair is somehow diminished or lesser than the more hirsute among us. Hair is hair, it needs to be kept neat, clean, as simple and maintenance free as it possibly can be. I understand that lots of people worry about such stuff – I’m just not one of them. Never have been. Don’t think I ever will be. In the 70’s when I was a teenager, I didn’t get upset when my parents wanted me to get a haircut – no big deal. Whatever. Plenty of other things to get angsty and rebellious over, but hair wasn’t ever on the list. For the most part, for the last several decades – buzz cut, #2, all over. It’s quick, it’s simple, and the only reason I pay $12 or $15 at SuperCuts or Fantastic Sam’s to get it done for me is that I can’t see in the back or around the ears to trim it up. If I could, it would be a simple matter to just get a pair of clippers and buzz, buzz, buzz everywhere until there wasn’t anything left to buzz. I think for our wedding I went and spent more to get a “good” haircut, but other than that, I can only remember one time that I got anything other than the most basic, simple buzz cut. 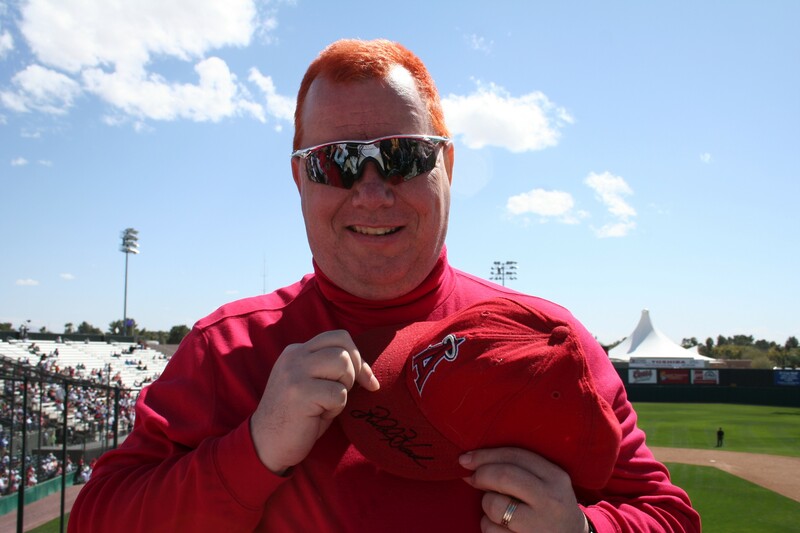 That’s me holding my autographed hat at one of the games we went to. The Long-Suffering Wife had arranged for me to meet Buddy Black, who was the Angels’ pitching coach at the time. More to the point of this essay, I obviously looked a bit like a short-haired version of Bozo. My kids loved it. The Long-Suffering Wife put up with it. (“It’s your hair. It will grow out.”) My boss blew a gasket for reasons I still don’t understand. (I was in an office with a handful of people without any kind of contact with the public.) It grew out. It faded. I buzzed it back off a couple of weeks later. Today I was getting my latest haircut. The young lady performing the task was friendly and kept trying to convince me that I should do something other than my normal “#2 buzz cut all over.” I told her the only time I had done anything like that was when I had my last “Big-Zero” birthday and gave her the thumbnail version. She said, innocently, “So, you did this when you turned forty?” Kids, that’s how you earn the big tips! In order to make her point, while she did give me what I wanted and asked for, she did it in stages with stops along the way to see what it would look like with different cuts. What I ended up with, of course, was the usual. But it did give me some most interesting ideas for what to do when that next “Big-Zero” birthday rolls around. I always let my hair grow too long and then have it cut very short. It is like having two haircuts at the same time and great value for money!